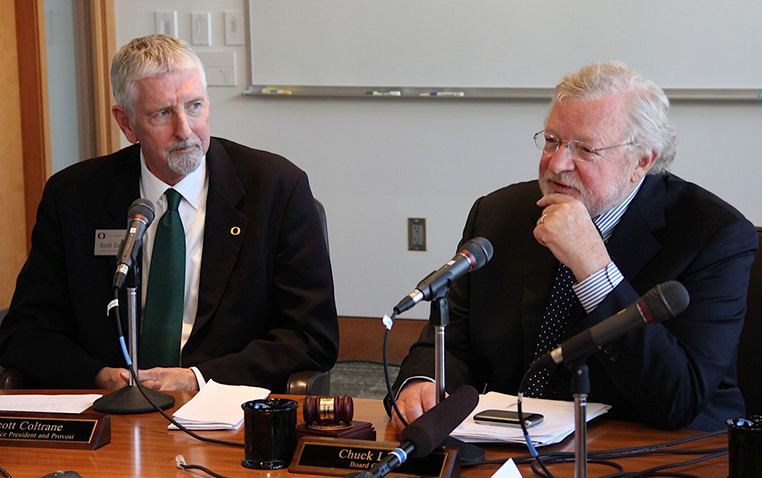 The University of Oregon Board of Trustees voted Thursday to accept the resignation of Michael R. Gottfredson as president and appointed Scott Coltrane – the university’s senior vice president and provost – as interim president. Coltrane will serve as interim president while the board conducts a comprehensive search for a permanent president. Neither motion received any dissenting votes. Following the vote by trustees to accept Gottfredson’s resignation, board Chair Chuck Lillis thanked both Gottfredson and his wife, Karol, for their service and leadership during a period of great transition and financial stress at the university. After nominating Coltrane to the interim post, Lillis said Coltrane’s steady hand and measured approach to leadership are the right fit for the Office of the President during this time of transition. The UO Board of Trustees is scheduled to meet in September for a regular quarterly meeting, and it plans to make naming a presidential search committee and launching the search a priority. Coltrane said he looks forward to guiding the UO as interim president and working with university leadership to advance the school’s priorities. Coltrane served as dean of the UO College of Arts and Sciences from 2008 to 2013 and was associate dean of the College of Humanities, Arts and Social Sciences at the University of California at Riverside from 2004 to 2008. He received a doctorate in sociology from the University of California at Santa Cruz in 1988 and was a sociology professor at the University of California at Riverside from 1988 to 2008. His research (paternity, stay-at-home dads) focuses on families, with special attention to the ways mothers and fathers divide parenting and housework. He is the author of four books and more than 100 articles and chapters. Coltrane received the Distinguished Teaching Award at UC Riverside, is past president of the Pacific Sociological Association and is an elected fellow of the American Association for the Advancement of Science.